We’ve all attended a yoga class and experienced the magic of a hands-on adjustment that has opened us up to a whole new world of aliveness. Adjustment and Alignment involves a gentle movement or correction that somehow completely transforms the posture, and therefore your practice; encouraging you to leave the mat with a better understanding and appreciation for your beautiful body. The Adjustment and Alignment classes are markedly different from the intrusive, forceful or just plain uncomfortable adjustments that leave you wondering where on earth the instructor wants your body to go. Too firm, too light, or without proper direction, their modification tends to create more questions than answers. So what constitutes as a “healthy” touch? And as a yoga teacher, how can we be sure our students experience all the positive enhancements a well-guided adjustment can bring? First, we need to focus on why we practice yoga asana in the first place. Most, if not all, yogis will agree that the practice is far more than flexible hamstrings and strong core muscles. Yoga is an inner journey; allowing the practitioner to connect with their breath while cultivating a profound love and respect for their body. However, like any sound structure, it can be challenging to fabricate the intricate details of the inner workings when the foundation is weak. And this is where yoga adjustment and alignment comes into play; providing a solid understanding of each pose. After all, it’s only when your body is completely aware of where it safely needs to be that your mind can begin to move inwards, cultivating a true yogic journey. It’s no secret that practicing yoga is good for your health. In fact, ancient scriptures tell us that asanas have been performed by yogis for centuries to manifest the plethora of benefits that promote euphoria and well-being. Yoga poses have been designed to place the physical body in positions that cultivate awareness, relaxation and concentration; however, this only applies if one performs them correctly. Basic alignment is important as it ensures the practitioner receives the maximum benefit that each pose has to offer. By practicing with a clear understanding of where the body should be, the health and integrity of muscles, joints and internal organs remain uncompromised. Daily practice increases strength and flexibility without causing any pain, discomfort or injury. Naturally, different muscles and joints within the body are designed to operate under contrasting workloads and levels of flexibility. Not to mention that every individual body has distinct ranges and limitations. As a yoga instructor, one should keep in mind that no two people can perform a yoga pose to look the exact same way. By attending an advanced adjustment and alignment workshop, instructors can perfect the art of assisting from experts in yogic science. By developing a deeper understanding of anatomy, kinesiology and correct alignment within the asana, teachers can ensure their students safely receive the benefits of yoga for years to come. Think back to your experience as a student - how a simple, guiding touch transported you from a potential injury to safety, from discomfort to freedom, from unease to pleasure in a posture! With this course, we, at Rishikul Yogshala offer you a chance to aspire to be that mentor for someone else. 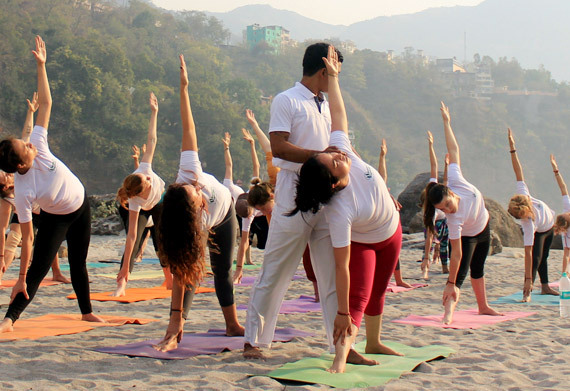 Understand how, by developing a clear foundation of yoga asanas yourself, you can assist your students in the discovery of their fullest potential; allowing all the transformative benefits of yoga to seep into and enhance their world. Come, join us for this in-depth understanding and knowledge of adjustment and alignment through our perfectly crafted workshops and get a chance to rise above.